Submitted by Alexander Briones on Nov. 30, 2017. Originally published on November 2, 2016 and updated on November 30, 2017. Thanks to the efficiency and practicality of their mechanical filtration, we still haven't found better alternatives to pop filters. At the time of this update, they remain very much in demand, positioned between the singer and the microphone to prevent fast moving air from hitting the mic capsule. Stop consonants (also called "plosives") force air to move faster, which hits the mic's diaphragm hard enough to cause unwanted signal clipping. Pop filters dissipate the air reducing its velocity, allowing for clean vocal recording even when using words that start with consonants like "P" and "B". In addition to relieving excess air movements, these filters also prevent saliva and moisture from getting into the microphone to avoid potential internal damage. As such it is imperative that you get a good pop filter for your recordings, and this is where we come in with this guide to the best pop filters on the market, to help you choose one that fits your budget and preferences. Here are the top rated pop filters which include everything from affordable nylon mesh filters to expensive handbuilt wire mesh ones. 87 out of 100. Incorporating 175+ ratings and reviews. The Musician's Gear Double Pop Filter employs an interesting method of removing the B and P consonant plosives - two pop filters divided by around half an inch of air space. This configuration has double the efficiency of conventional pop filters, the first filter redirects the plosive consonants to the open space in between which disperses the excess air pressure, while the second filter further disperses any unneeded air movements while allowing the sound to pass through clearly. 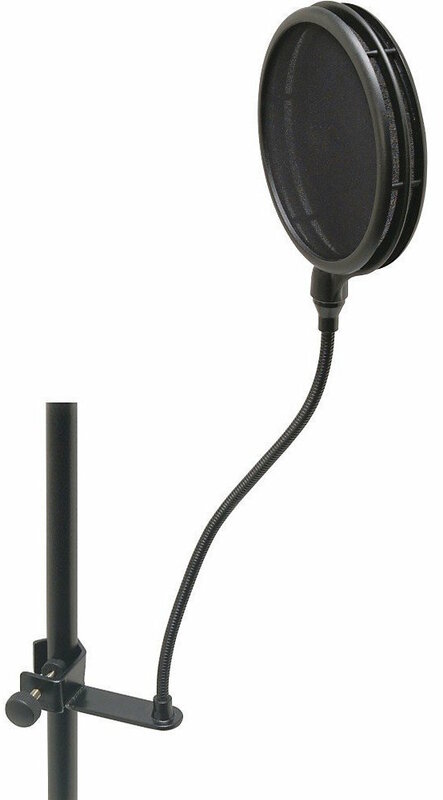 Other features of this pop filter include standard flexible gooseneck for positioning and a c-clamp for securing the pop filter on a mic stand. For close mic vocal recording, the Musician's Gear Double Pop Filter continues to get the job done reliably well, as attested to by many users. Many claim that it outperforms other conventional pop filters, prompting some of them to retake some vocal recordings for the added clarity. Some have even used it for capturing whistling, which is quite impressive for a filter that's affordably priced. Others also comment on the sturdy and stable assembly of this filter, stating that it is easy to setup and that it stays in plays for a good amount of time. There are a few who are concerned with the extra weight of the double screen assembly, and its effect on mic stand balance. The clamp also got a few complaints, because it does not match the thinner extension arm that holds the mic, adding to the balancing issue. If you are into close mic singing, or you're looking to record plosive heavy singing and whistling, then this is an affordable pop filter to have ready. 86 out of 100. Incorporating 100+ ratings and reviews. The On-Stage ASVS6GB is a straight forward pop filter that follows the conventional form factor, with a simple nylon mesh serving as its filter. The diameter is 6", while the gooseneck is 13" long, both of which are good enough for most applications. While it does not have as much plosive stopping power as dual mesh ones, it does provide good enough filtration to warrant a good number of positive reviews. Most of the commendations are from users who are impressed by the ASVS6GB's value for money and overall performance. There are also some who are happy with the quality of the gooseneck, while others appreciate the bundled 6" extension bar. There were a few who found the gooseneck to be a bit stiff, on the flipside, this stiffness is what makes it stable. The On-Stage Stands ASVS7GB is a good budget pop filter for those who are starting out with recording. 92 out of 100. Incorporating 550+ ratings and reviews. While the popularity and affordability of desktop USB mics have made home recording more accessible, some manufacturers didn't take compatibility with standard pop filters into account. This is where Auphonix came in with their specially designed clamps that conveniently and securely attach to popular USB desktop mics like the Blue Yeti. 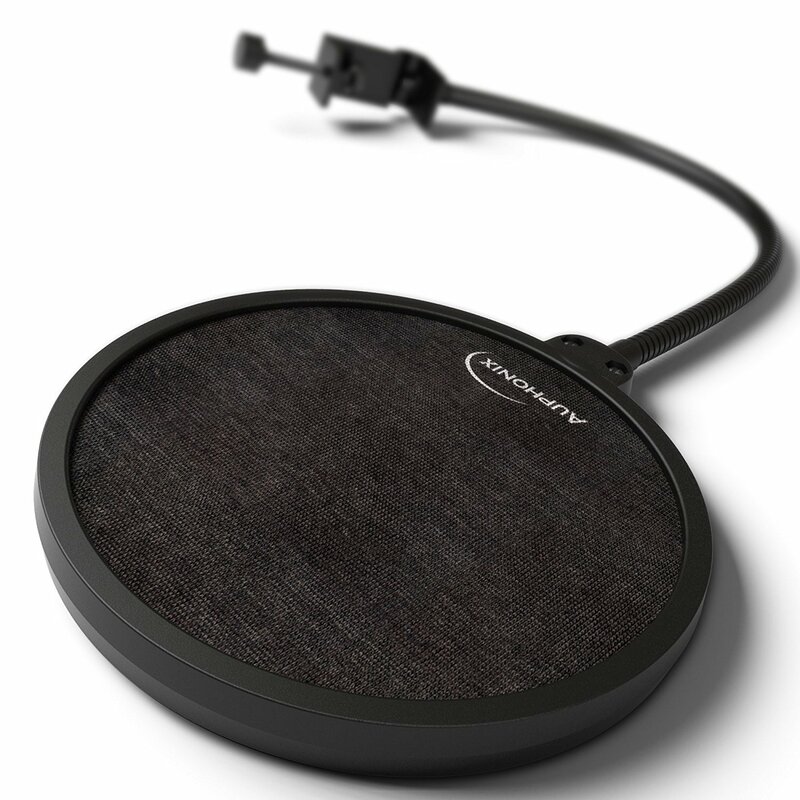 The Auphonix pop filter features a double mesh filter design and comes in a round shape that is 6" in diameter (also available in a smaller 4" version). It also features an adjustable gooseneck for precise and stable positioning. More and more are taking their time to write good reviews for this affordable pop filter, and a good number of them describe in detail how they are satisfied with its overall performance. From its ability to block pops, to its versatile gooseneck and clamp design, many consider it as the best choice for home recording studios that utilize desktop USB mics. There are a few who reported that the rubber pad on the clamp gave out after some time. So just be careful when using the clamp so as to not scratch your microphone. If you're looking for a workhorse pop filter to improve your podcasting and home recordings, the Auphonix Pop Filter is highly recommended. 88 out of 100. Incorporating 90+ ratings and reviews. The RaXXess Stoppit filter is an affordable filter that gets the job done with its straightforward design and practical price tag. It follows conventional pop filter design with a 6" diameter round fabric filter that is attached to a gooseneck and a clamp. The clamp allows for quick and secure attachments to mic stands and desks, making it useable for desktop recording as well. It also features a secondary pivot joint that lets you set the screen angle to match the specific pickup axis of the mic you're using. Secondary pivot joint for screen angle adjustments. 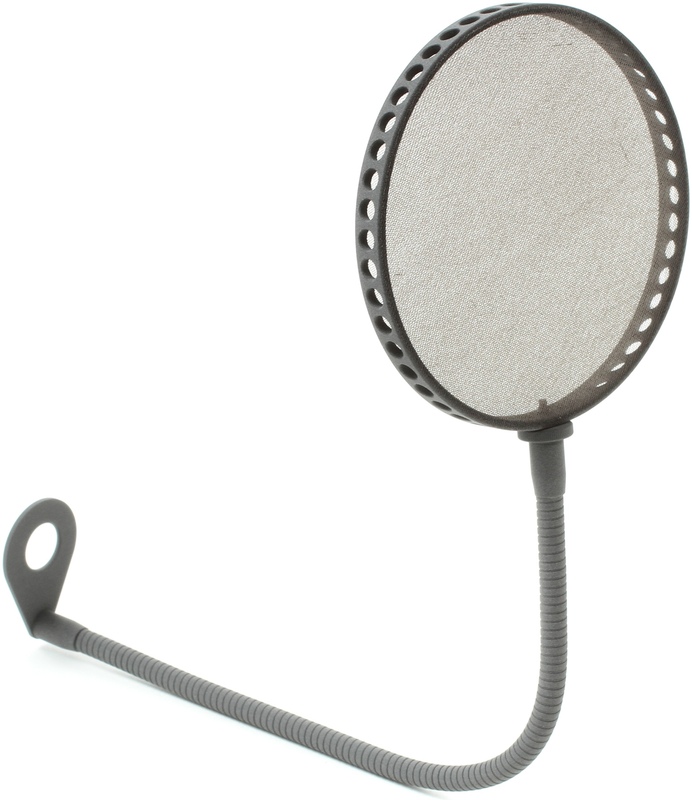 The RaXXess Stoppit Pop Filter rakes in a lot of thumbs up from users who are impressed by its value for money. Many are surprised by the difference that it makes to their recordings, with noticeable clarity improvement. Market sentiment still leans heavily towards the positive, with most users satisfied with its performance. There are a few who reported out of the box quality issues, where they find out that the filter is damaged before they even started using them. There are also reports of concern over the thin mesh fabric material which may tear if not carefully handled. Given its price and performance, the Raxxess Stoppit Pop Filter gets an easy recommendation, especially if budget is limited. Instead of going for the usual nylon mesh filter material, the Stedman Proscreen PS101 comes with a metal screen. The louvered metal diverts plosive air downwards, while allowing sound to pass through clearly to the mic. This results in good pop filtering without the durability issues inherent to cloth or nylon mesh. The filter diameter is 4.6" while gooseneck is 20" long. Good reports continue to pour in for the Stedman Proscreen PS101, with many specifically commending it for its plosive blocking capability. It has been used along side many popular mics, including the Blue Yeti and the AT2020 - with very good results, as attested to by many users. There were some users who were not too happy with its small diameter. Other than that, there are plenty more good things mentioned than bad. The Stedman Proscreen PS101 is a good quality metal pop screen that will make a good addition to any home recording studios. 89 out of 100. Incorporating 70+ ratings and reviews. 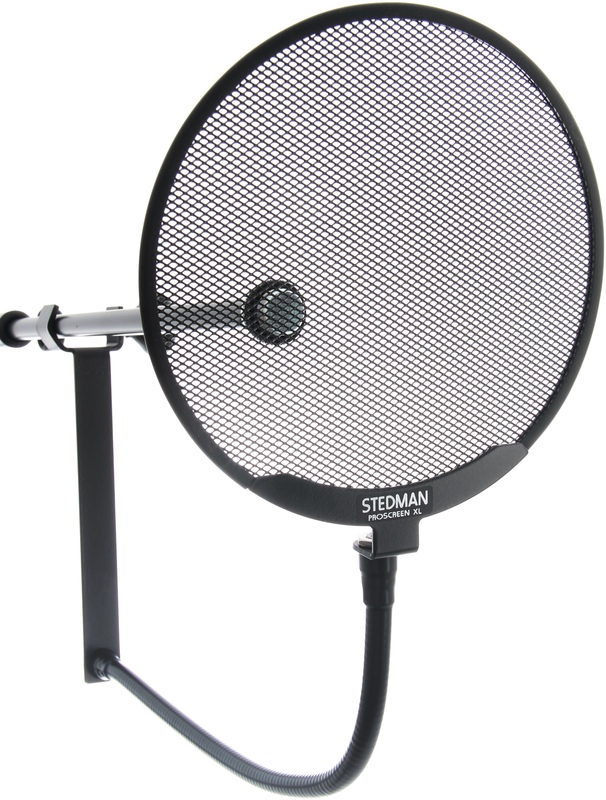 The Stedman Proscreen XL Pop Filter features a 6" diameter filter that's made using material that they themselves designed and patented. While they did not give the exact details, some have described the filter material to be more like metal, that louver plosives to stop them from reaching your microphone, while keeping the sound uncolored. The company describes the material to be easy to clean and reliable, other features include a 13" flexible gooseneck and a nylon-tipped clamp that is meant to avoid scratches on your mic stand. Finally, the Stedman Proscreen XL Pro Filter commands a premium price relative to others, but it was still able to satisfy most of its users. The Stedman Proscreen XL Pop Filter continues to get good market feedback, with many reporting that it exceeded their expectations both in terms of performance and value for money. 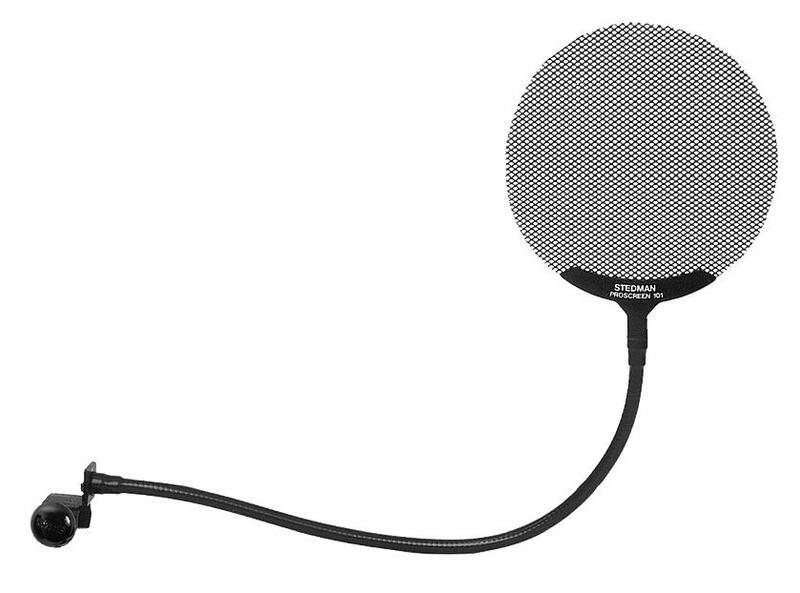 Many reported that the unique material of this pop filter works really well, resulting in cleaner recordings. While others found the adjustability and reliability to be well worth the extra investment. Speaking of investment, a few users found the price to be too high for a pop filter, but they are easily overwhelmed by those who say otherwise. There are a few who commented that the filter does not work on certain vocal timbres, and others reminded that proper vocal techniques are still required to get the most out of this premium filter. If budget is not an issue and you're looking for a reliable non-fabric mesh, then this American-made high quality pop filter is highly recommended. The Pauly Superscreen Pop Filter is a premium handmade filter that's meant for professional studio work. The high-price tag is justified by being handcrafted in Germany, its weapons-grade build quality and its proprietary gooseneck - which is flexible yet stable - able to stay in place for a very long time unless moved. 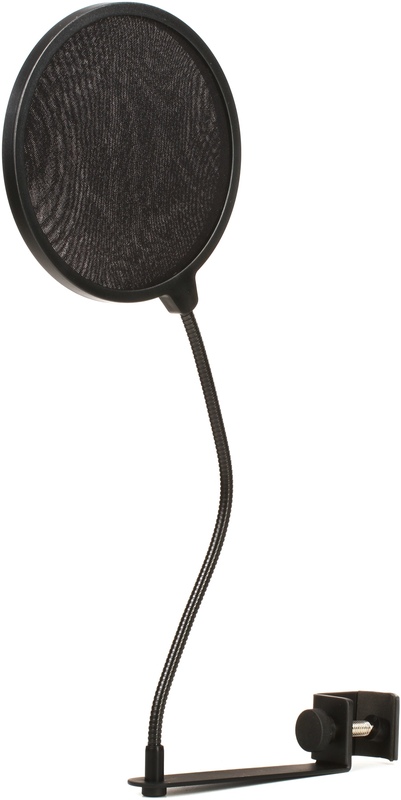 The entire assembly of the pop filter is also designed to produce as little noise as possible, making this a great pop filter to work with in professional studios. The fabric membrane used is especially designed to stop plosives without disrupting the high frequencies. With its high price tag, many users were skeptical at first, but most turned into fans of the Pauly Superscreen pop filter after using it. Many reported being impressed by the build quality, quiet operation and more importantly, the virtually zero sound degradation. "High quality but a bit too pricey" is a fair summary of how many describe the Pauly Superscreen. There was one who reported getting low frequency rumbling from the pop filter when it is mounted to the mic stand, so for even quieter recording, he mounted the clamp to a separate stand. The Pauly Superscreen requires quite an investment for a pop filter, and it is obviously not for the faint of heart, but those who invested in it got more than what they bargained for. It is highly recommended for professional studios. Most manufacturers choose to build their pop filters using nylon or other fabric materials, usually because they are cheaper and more importantly they get the job done. Others utilize woven or perforated metal, of which some claim to provide improved clarity and transparency, specifically in the upper frequencies. There is no definite answer as to which is better, many experienced users still prefer nylon mesh material, while more premium builders prefer metal. The standard filter diameter that many pop filters follow is 6", but there are smaller ones, with 4" being the most common. The bigger the pop filter diameter is, the more room for movement the vocalist has. This allows for natural body movements while recording, instead of being strictly in one position which can sometimes kill inspiration and vibe. Smaller pop filters are ideal for small mics and small recording spaces, they are also lighter, which reduces the stress on the gooseneck, resulting in increased stability. The length, flexibility and stability of the filter's gooseneck plays a very important role in positioning the filter. You don't want a filter that droops and requires constant adjustments, and you also don't want a neck that requires too much effort to bend to position. Most pop filters come with clamping and mounting mechanisms that allow for secure attachment to mic stands, and they should be fine if you use stand mounted mics. However, if you're using a desktop mounted mic, especially for home recording, you'll want a pop filter that can clip on the desk, or on the mic itself. First, we looked for pop filters that are readily available from US music gear retailers. We then made a short-list and compiled related data about them, including user ratings, reviews, forum discussions, expert opinions. You can view our short-list in the Music Gear Database. The data we gathered for this 2017 update tallied to over 7,100 sources, all of which were then processed by the Gearank Algorithm to produce the ratings out of 100 which enabled us rank the top pop filters. For more information about this process, see How Gearank Works. Submitted by Jason Horton on Dec. 1, 2017.